Do you need work done on your sewer in Scotts Valley? Sewer repair can feel like a daunting prospect if you’re a homeowner, especially if you haven’t had to do one before. After all, horror stories abound about difficult, long, arduous repairs that keep you out of your home for days or weeks at a time. However, sewer repair doesn’t have to be like that! In fact, most of the sewer repairs we perform are simple, straightforward, and only minimally disruptive to your life. That is thanks to advances in technology, but also to the professionalism and skill of our Scotts Valley plumbers. For them, sewer repair is a regular thing. It’s not a big deal, so they handle it like they handle anything else in their daily lives: with confidence and competence. 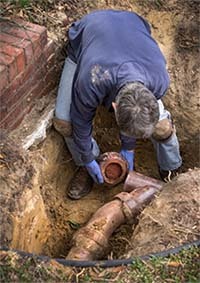 Sewer repair is usually a simple and straightforward process. If we suspect a problem with your sewer, we’ll send a camera attached to a flexible metal pipe down your sewer, from the access point inside your house. This camera will help us determine whether the sewer is actually the problem and, if it is, where in the sewer the problem exists. Once we’ve located the problem, we’ll determine the best way to solve it. Rest assured that this does not mean digging up your entire yard! In the past, repairing a sewer line meant digging along the length of the line from the house to the street, diagnosing and fixing problems along the way. The problem was, this left the homeowner with a huge trench to fill and a yard to landscape after the sewer work was done. No wonder sewer repair got a bad reputation! Some people even had to lay concrete for sidewalks and driveways! Now, though, we use trenchless sewer repair for our work in Scotts Valley. This technology allows us to repair the sewer using that access point inside the home. For some repairs, we have to dig small holes outside. However, these are nothing like the giant holes of the past and are only minimally invasive in your yard. Most of the time, people don’t even notice that we dug! We can do nearly everything that we need to do to your sewer from inside your home. This includes repair pipes, and even replacing them. This also makes the repairs faster, because we don’t have to spend the time digging a trench along your sewer. Sure, no one wants to face a sewer repair. But with today’s technology, it’s a lot easier to get your repair done than it used to be! If you think you might need a sewer repair, don’t leave it until you have an emergency! Most sewer problems will only get worse over time, until you have a major backup and your home gets filled with sewage. Prevent that by calling us today. We’ll take a look at the situation and help you decide on the best next step for you and your family.